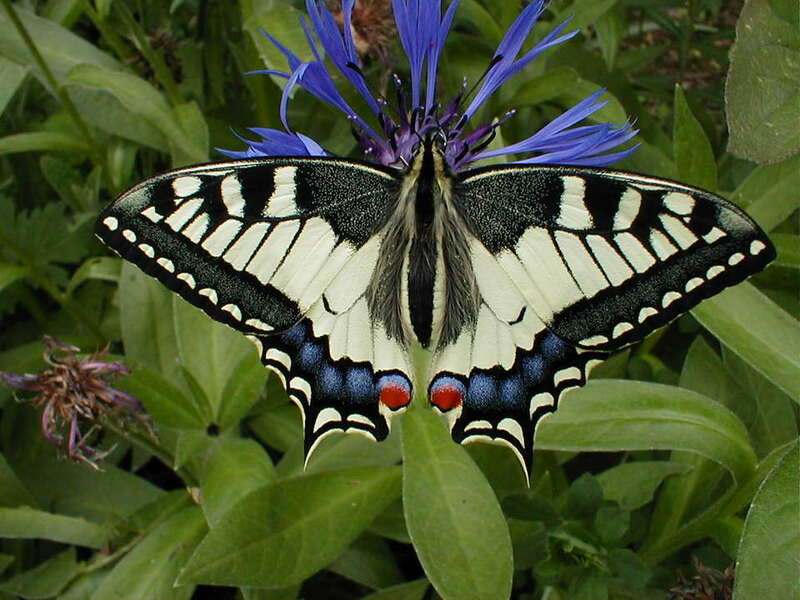 A butterfly is a mainly day-flying insect of the order Lepidoptera, the butterflies and moths. Like other holometabolous insects, the butterfly's life cycle consists of four parts, egg, larva, pupa and adult. Most species are diurnal. Butterflies have large, often brightly coloured wings, and conspicuous, fluttering flight. Butterflies comprise the true butterflies (superfamily Papilionoidea), the skippers (superfamily Hesperioidea) and the moth-butterflies (superfamily Hedyloidea). All the many other families within the Lepidoptera are referred to as moths. Butterfly eggs are protected by a hard-ridged outer layer of shell, called the chorion. This is lined with a thin coating of wax which prevents the egg from drying out before the larva has had time to fully develop. Each egg contains a number of tiny funnel-shaped openings at one end, called micropyles; the purpose of these holes is to allow sperm to enter and fertilize the egg. Butterfly and moth eggs vary greatly in size between species, but they are all either spherical or ovate. Butterfly eggs are fixed to a leaf with a special glue which hardens rapidly. As it hardens it contracts, deforming the shape of the egg. This glue is easily seen surrounding the base of every egg forming a meniscus. The nature of the glue is unknown and is a suitable subject for research. The same glue is produced by a pupa to secure the setae of the cremaster. This glue is so hard that the silk pad, to which the setae are glued, cannot be separated. The egg stage lasts a few weeks in most butterflies but eggs laid close to winter, especially in temperate regions, go through a diapause (resting) stage, and the hatching may take place only in spring. Other butterflies may lay their eggs in the spring and have them hatch in the summer. These butterflies are usually northern species, such as the Mourning Cloak (Camberwell Beauty) and the Large and Small Tortoiseshell butterflies. Butterfly larvae, or caterpillars, consume plant leaves and spend practically all of their time in search of food. Although most caterpillars are herbivorous, a few species such as Spalgis epius and Liphyra brassolis are entomophagous (insect eating). Some larvae, especially those of the Lycaenidae, form mutual associations with ants. They communicate with the ants using vibrations that are transmitted through the substrate as well as using chemical signals. The ants provide some degree of protection to these larvae and they in turn gather honeydew secretions. Caterpillars mature through a series of stages called instars. Near the end of each instar, the larva undergoes a process called apolysis, in which the cuticle, a tough outer layer made of a mixture of chitin and specialized proteins, is released from the softer epidermis beneath, and the epidermis begins to form a new cuticle beneath. At the end of each instar, the larva moults the old cuticle, and the new cuticle expands, before rapidly hardening and developing pigment. Development of butterfly wing patterns begins by the last larval instar. Butterfly caterpillars have three pairs of true legs from the thoracic segments and up to 6 pairs of prolegs arising from the abdominal segments. These prolegs have rings of tiny hooks called crochets that help them grip the substrate. Some caterpillars have the ability to inflate parts of their head to appear snake-like. Many have false eye-spots to enhance this effect. Some caterpillars have special structures called osmeteria which are everted to produce smelly chemicals. These are used in defense. Host plants often have toxic substances in them and caterpillars are able to sequester these substances and retain them into the adult stage. This helps making them unpalatable to birds and other predators. Such unpalatibility is advertised using bright red, orange, black or white warning colours. The toxic chemicals in plants are often evolved specifically to prevent them from being eaten by insects. Insects in turn develop countermeasures or make use of these toxins for their own survival. This "arms race" has led to the coevolution of insects and their host plants. Wings or wing pads are not visible on the outside of the larva, but when larvae are dissected, tiny developing wing disks can be found on the second and third thoracic segments, in place of the spiracles that are apparent on abdominal segments. Wing disks develop in association with a trachea that runs along the base of the wing, and are surrounded by a thin peripodial membrane, which is linked to the outer epidermis of the larva by a tiny duct. Wing disks are very small until the last larval instar, when they increase dramatically in size, are invaded by branching tracheae from the wing base that precede the formation of the wing veins, and begin to develop patterns associated with several landmarks of the wing. Near pupation, the wings are forced outside the epidermis under pressure from the hemolymph, and although they are initially quite flexible and fragile, by the time the pupa breaks free of the larval cuticle they have adhered tightly to the outer cuticle of the pupa (in obtect pupae). Within hours, the wings form a cuticle so hard and well-joined to the body that pupae can be picked up and handled without damage to the wings. When the larva is fully grown, hormones such as prothoracicotropic hormone (PTTH) are produced. At this point the larva stops feeding and begins "wandering" in the quest of a suitable pupation site, often the underside of a leaf. The pupal transformation into a butterfly through metamorphosis has held great appeal to mankind. To transform from the miniature wings visible on the outside of the pupa into large structures usable for flight, the pupal wings undergo rapid mitosis and absorb a great deal of nutrients. If one wing is surgically removed early on, the other three will grow to a larger size. In the pupa, the wing forms a structure that becomes compressed from top to bottom and pleated from proximal to distal ends as it grows, so that it can rapidly be unfolded to its full adult size. Several boundaries seen in the adult color pattern are marked by changes in the expression of particular transcription factors in the early pupa. The adult, sexually mature, stage of the insect is known as the imago. As Lepidoptera, butterflies have four wings that are covered with tiny scales (see photo). The fore and hindwings are not hooked together, permitting a more graceful flight. An adult butterfly has six legs, but in the nymphalids, the first pair is reduced. After it emerges from its pupal stage, a butterfly cannot fly until the wings are unfolded. A newly emerged butterfly needs to spend some time inflating its wings with blood and letting them dry, during which time it is extremely vulnerable to predators. Some butterflies' wings may take up to three hours to dry while others take about one hour. Most butterflies and moths will excrete excess dye after hatching. This fluid may be white, red, orange, or in rare cases, blue.